compensate the families of the 10 deceased who gave up the ghost in a fatal auto crash at the Asese end of the Lagos-Ibadan Expressway. The Public Education Officer of the FRSC, Bisi Kazeem, added that the company and the driver of the vehicle would also be prosecuted. The Punch had reported that about 42 passengers left the South-East for Lagos in a Marcopolo bus belonging to the company. Survivors of the accident claimed that the bus driver smoked cigarette, drank alcohol and drove recklessly. He was alleged to have threatened the passengers who tried to report him to the police. 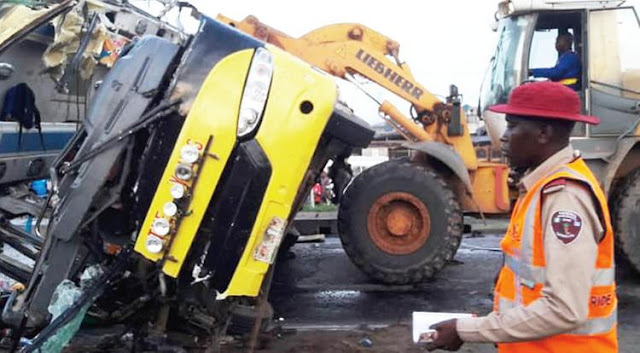 A survivor, Godwin Ikechukwu, said when he called the customer care line of the transport company to report the excesses of the driver, he was assured that the matter would be addressed. He noted that when nothing was done and he called back, the phone rang out several times before it was switched off. The FRSC spokesperson, Kazeem, said it called the management of the company for a meeting on Friday, adding that among the resolution was the compensation of the victims’ families. He said, “We invited Young Shall Grow Motors management to Abuja to have an interface with us. We asked them to produce the driver’s details. Also, both the company and the driver are liable and will be prosecuted."